Delicious vegan / vegetarian split pea soup with bacon flavoring & bits of imitation bacon. The rich blend of herbs, spices, and peas create a robust vegan soup that you will be proud to serve! Just add water and simmer for 45-44 minutes or until peas are tender. Each 12.75 oz. 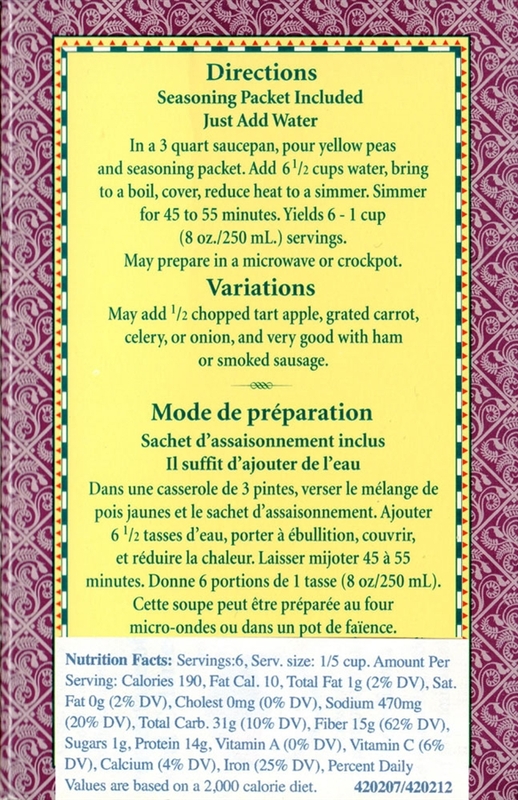 package makes 6 servings of bacon flavored vegan/vegetarian pea soup. The Vegg - Vegan French Toast Mix - 4.0 oz Canister Roads End Organics - Gluten Free Mac & Chreese - Alfredo Style Vegan Dream - Hot Chili Pepper Vegan Jerky Stonewall's Jerquee - Tandoori "Chicken"